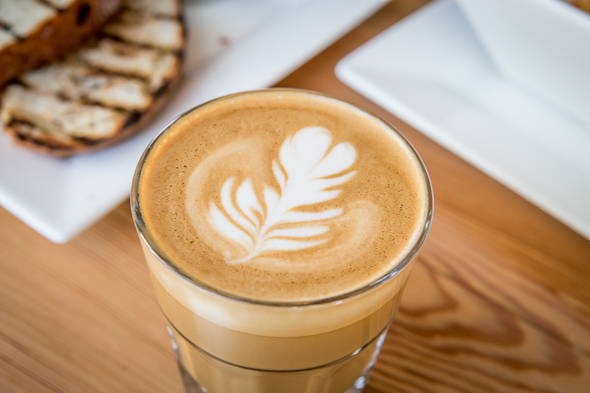 Ashdale Brunch and Espresso is a welcome addition, even if Leslieville is already blessed with some great breakfast and brunch spots. 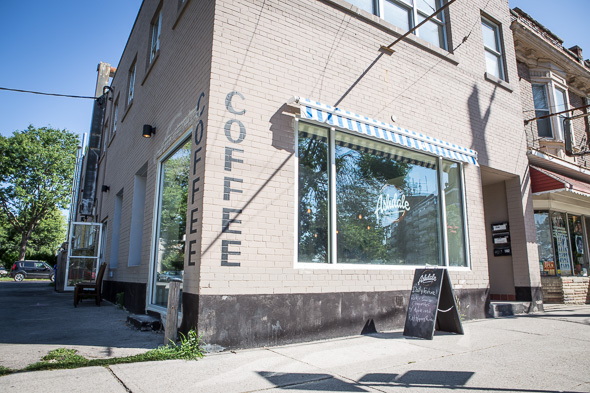 Located at the northeast corner of Ashdale Ave. and Queen East in what was once Voulez-Vous Cafe , it's a bit further east than those other places. 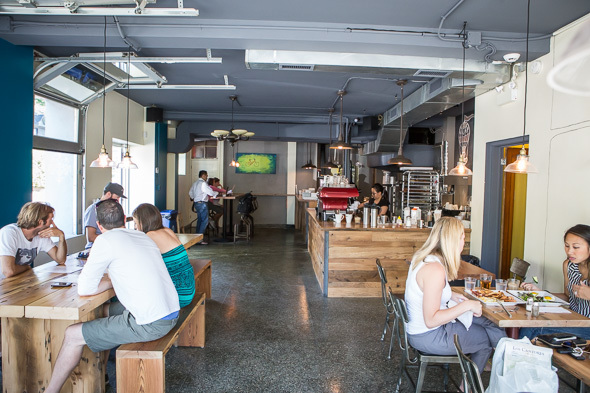 This bright space has a quasi-industrial feel, with a communal table with bench seating along with smaller tables for those who don't want to sit with strangers. There's also WiFi available for those visiting with laptops (show the staff a hidden talent and they'll tell you the password). 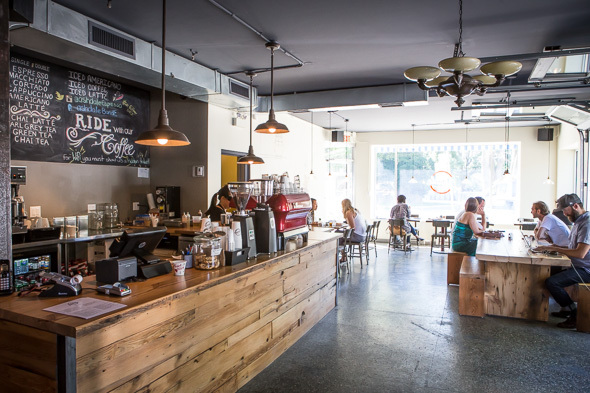 Co-owner Edward Moylan is a self-confessed coffee addict and has been since he was a teenager, when he was a regular at Dooney's (RIP) in the Annex. He admits he now drinks between 17 and 30 espressos (!!) a day, so it's a good thing he has this place to help support his habit. 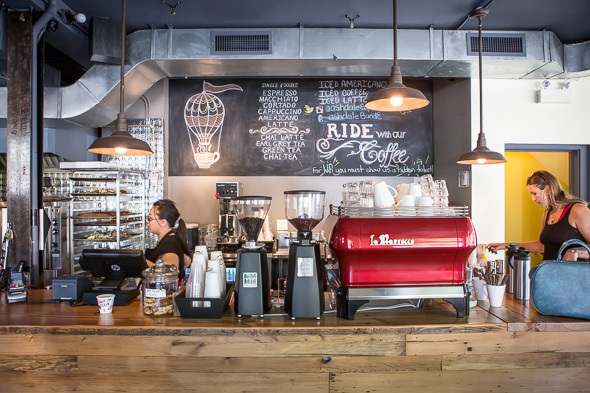 Chipper front of house manager/barista Rose Trinh pulls espresso shots on a shiny red La Marzocco using Rufino Riserva beans; espressos and Americanos go for $3.15 each including tax (50 cents for an extra shot) while a latte costs $3.95 (and comes with nice latte art). Drip coffee (reg. $2.10/large $2.45 with tax) is also available. 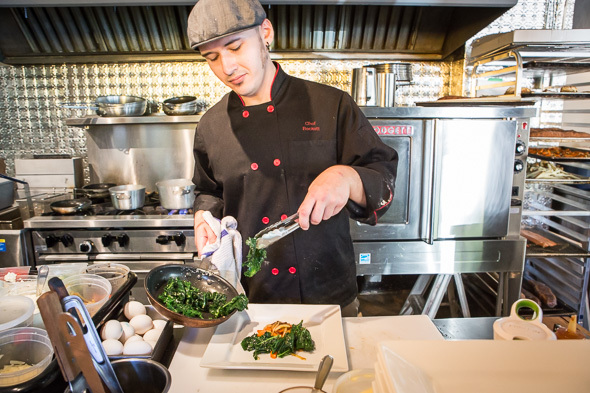 As for food, co-owner/chef Brian Beckett ( Bistro 990 , Mildred's Temple Kitchen ) tries to make everything in-house in the open kitchen. He grew up in his dad's butcher shop, so he respects his ingredients; he even goes to the local farmer's market to pick out his produce himself. Beckett trained with Neil Baxter at the Stratford Chefs School , which is where he really got into breadmaking - he bakes a different bread here daily ($1.50 as a side, $4.50 for a take-home loaf) - and claims they haven't repeated one yet. The day we visit, it's a rosemary, roasted garlic and caramelized onion concoction. 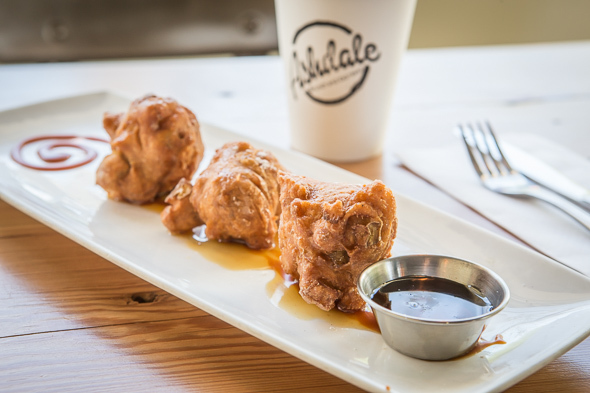 We split the house-made apple fritters ($6.75), which contain little chunks of Granny Smith apples and come with Canadian maple syrup as a dip. They're an ideal way to start off brunch. 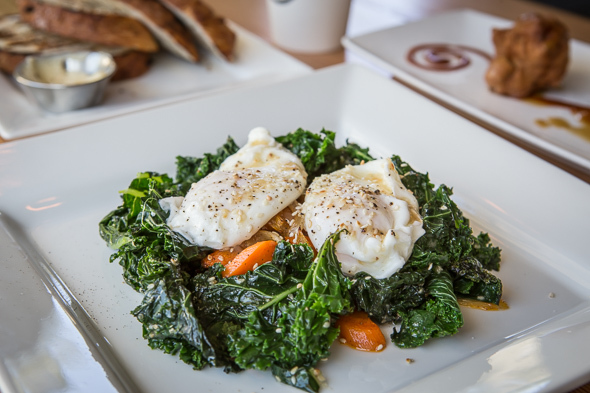 The Bird's Nest ($7.50) is composed of a couple of soft poached eggs nesting on cayenne pepper-roasted carrots surrounded by sauteed kale drizzled in roasted garlic and sesame sauce. Thanks to the cayenne, it's got a bit of spice to it, and the sesame seeds are a nice touch. There's just something satisfying about runny eggs with kale. 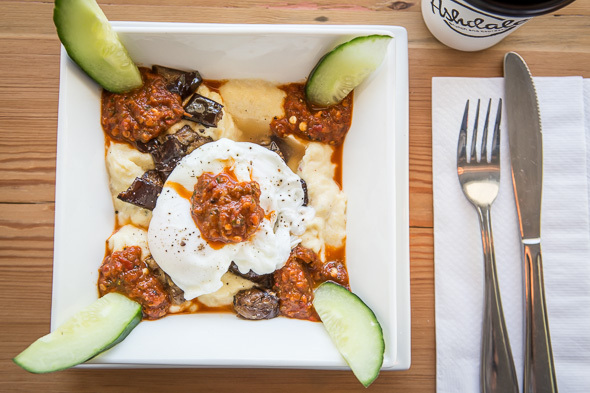 Inspired by Beckett's travels, the Mediterranean Skillet ($9.50) of goat cheese polenta topped with house-smoked eggplant, two poached eggs and harissa is my favourite of the dishes we try. The smoky spice of the harissa mixed with the eggplant, yolks and flavourful polenta makes for a winning - and filling - combination. I'd be happy to eat this every day. My brunch buddy's fave is the Chimi Pork and Eggs ($9) - braised pork belly topped with a pair of sunny side up eggs served with a tart, bright chimichurri and a choice of salad or hand-cut fries as a side. 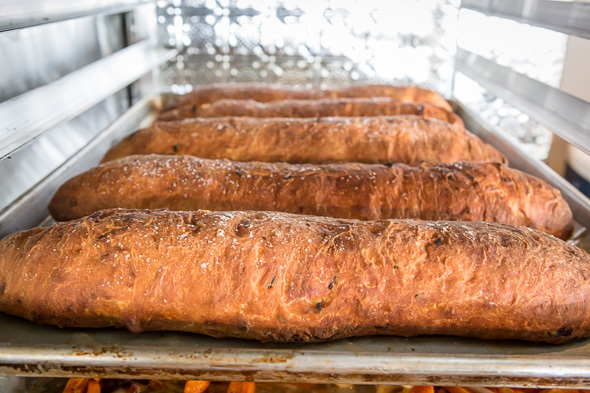 Beckett's pork belly is actually pretty lean, as he renders out the excess fat, so you can feel less guilty about eating it, even if it still tastes delicious. If I lived closer, this would definitely make for a good neighbourhood haunt, as it's on a rather sparse stretch of Queen that needs one. Unsurprisingly, locals seem to be embracing the place. "Not to brag, but I've got the best customers in the world," Beckett says. "They understand what we're trying to do here." Note that the kitchen is closed on Tuesdays but the cafe is still open.